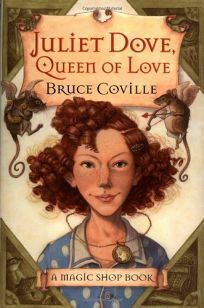 In the fifth installment of Bruce Coville's Magic Shop series, Juliet Dove, Queen of Love, a mysterious woman gives shy, plain Juliet a magic amulet. Suddenly, all the boys in her class start noticing her-and falling in love with her. Juliet doesn't want all the attention, but she can't get the amulet to come off.